Size-22 to 24 inches for males, 20 to 22 inches for females. Correct size is important. Oversize to be severely penalized. Proportion-Slightly longer than tall, in a ratio of 10 to 9. Height from withers to ground; length from point of shoulder to point of buttocks. The Griffon must not evolve towards a square conformation. Substance medium, reflecting his work as an all-terrain hunting dog. The head is to be in proportion to the overall dog. The skull is of medium width with equal length from nose to stop and from stop to occiput. The skull is slightly rounded on top, but from the side the muzzle and head are square. The stop and occiput are only slightly pronounced. The required abundant mustache and eyebrows contribute to the friendly expression. The eyes are large and well open, more rounded than elliptical. They have an alert, friendly, and intelligent expression. Eye color ranges in all shades of yellow and brown. Haws should not show nor should there be protruding eyes. The ears should be of medium size, lying flat and close to the head, set high, at the height of the eye line. Nose-Well open nostrils are essential. Nose color is always brown. Any other color is a disqualification. Bite scissors. Overshot or undershot bite is a serious fault. Neck- rather long, slightly arched, no dewlap. Topline- The back is strong and firm, descending in a gentle slope from the slightly higher withers to the base of the tail. Body-Chest- The chest must descend to the level of the elbow, with a moderate spring of rib. The chest must neither be too wide nor too narrow, but of medium width to allow freedom of movement. The loin is strong and well developed, being of medium length. The croup and rump are stoutly made with adequate length to favor speed. The tail extends from the back in a continuation of the topline. It may be carried straight or raised slightly. It is docked by one-third to one-half length. Nose any color other than brown. Black coat. 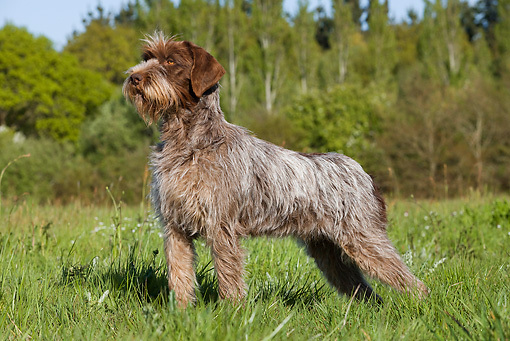 Click Here to Learn about breeder background checks on Wirehaired Pointing Griffon breeders if you are looking for Wirehaired Pointing Griffon puppies for sale. Click Here to learn how ResearchBreeder.com can help you find healthy Wirehaired Pointing Griffon puppies for sale.Wirehaired Pointing Griffon puppies for sale. Click Here to order a Breeder or Kennel Background Check on Wirehaired Pointing Griffon Breeders that may have Wirehaired Pointing Griffon puppies for sale. Click here to find the national breed club for Wirehaired Pointing Griffon puppies for sale. Click Here to purchase a list of approved ResearchBreeder.com Wirehaired Pointing Griffon Breeders who have Wirehaired Pointing Griffon puppies for sale.